Artistic impression of graphene-quantum dot photodetectors integrated with CMOS read-out circuitry. Each square represents one image sensor (with >100,000 photosensors), and the total area represents the Si-CMOS wafer on which large-volume processing is performed. Despite the revolution spurred on by integrated circuits based on complementary metal-oxide-semiconductor (CMOS) technology, the integration with visible light devices is proving tricky. Now researchers have combined graphene and quantum dots with CMOS integrated circuits to create a broadband image sensor that can operate as a digital camera [Goossens et al., Nature Photonics (2017), doi: 10.1038/nphoton.2017.75]. The team from the Institut de Ciencies Fotoniques (ICFO), Institució Catalana de Recerc¸a I Estudis Avanc¸ats (ICREA), and Graphenea in Spain created integrated devices by first coating each CMOS pixel structure with graphene using chemical vapor deposition. 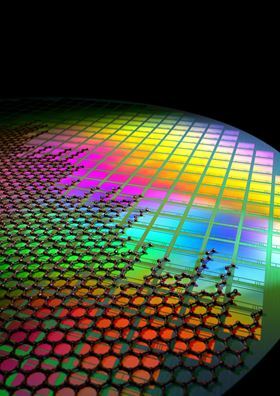 The graphene is patterned to define the pixel shape using lithography and connected to readout circuitry. Finally, a sensitizing layer of PbS quantum dots is deposited onto the graphene using a simple spin-casting process. Light is detected via the quantum dot layer, where it is absorbed and photogenerates holes (or electrons). The holes (or electrons) circulate in the graphene layer producing a change in conductance. Because graphene is so highly conductive, the photoconductor has extremely high gain and responsivity. The combination of large signal and low noise gives rise to a high level of detectivity and broad sensitivity across the spectrum from the ultraviolet to the near infrared. The sensitivity could be extended even further into the infrared by using different low-bandgap quantum dots. “The broadband image sensor, which consists of more than 100,000 of these phototransistor on a small chip, is very similar to the chip inside the digital camera in a phone,” explains Frank Koppens, who led the effort with Gerasimos Konstantatos. By converting the incoming light into electronic signals for each pixel, and building up an image, integrated graphene-CMOS sensors can be used as a digital camera able to detect ultraviolet, visible, and infrared at the same time. The resolution should be amenable to further improvement, suggest the researchers, because there appear to be no fundamental physical limits associated with shrinking the pixel size. Pixel pitches down to 1 micron are within reach, since lithographic patterning and contacting of graphene are the limiting factors. “Our work shows that this class of phototransistors may be the way to go for high-sensitivity, low-cost, infrared image sensors operating at room temperature addressing the huge infrared market that is currently thirsty for cheap technologies,” says Konstantatos. The stackability of graphene and other two-dimensional materials offers a wealth of opportunity to add new and different electronic and optoelectronic functions into the device. Researchers have integrated graphene flakes with conventional electronics in the past, points out Ravinder Dahiya of the University of Glasgow, but the integration of graphene-quantum dots with CMOS imagers in a room temperature process is an interesting new direction. The team is now working with ICFO’s tech transfer professionals to bring the new imaging and sensing technology to the market.